Corter Moon: I See Me! Giveaway! These are the cutest books, ever! They put your child right into the heart of the story! Now you have a chance to win one! It would make a wonderful Valentine's Day gift! Check out the giveaway below! Winner's Choice of I See Me! Growth Chart or a Who Loves Me? Storybook & Stickers Gift Set Giveaway! 1 lucky person will win their choice of I See Me! Growth Chart or a Who Loves Me? Valentine Edition Storybook & Stickers Gift Set! But it gets even better than that! If the winner chooses a growth chart, they get to pick from 8 adorable styles! If the winner chooses the storybook, they get to pick whether they want the blue or pink version! Too cute! Giveaway Dates ~ 2/2 12 AM EST through 2/16 11:59 PM EST Good Luck! 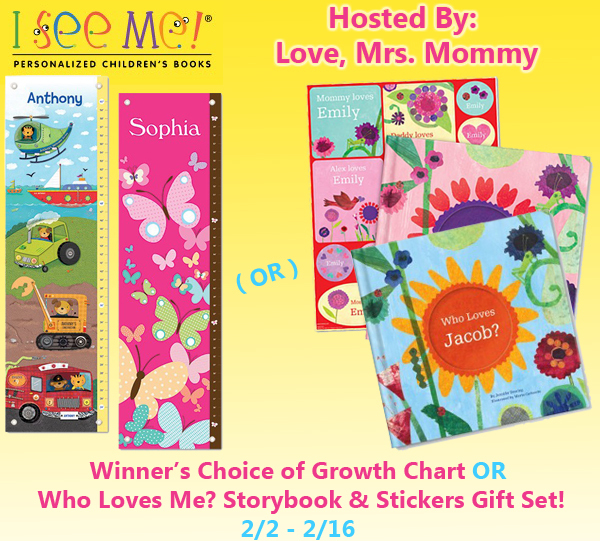 Disclosure: Love, Mrs. Mommy received the Love Is In The Air Growth Chart and Who Loves Me? Storybook & Stickers Gift Set free of charge to facilitate the above-mentioned review. Love, Mrs. Mommy and all participating bloggers are not held responsible for sponsors who do not fulfill their prize obligations. This giveaway is in no way endorsed or sponsored by Facebook or any other social media site. The winner will be randomly drawn by Giveaway Tools and will be notified by email. The winner has 48 hours to reply before a new winner will be drawn. If you would like to participate in an event like this please contact LoveMrsMommy (at) gmail (dot) com.